Charismatic and popular, a figure of openness and simplicity, Pope Francis has known how to spread his influence far beyond what might be considered the head of the Catholic Church’s constituency by speaking a language that believers and non-believers alike can relate to – no mean feat in an age where politicians and other public figures struggle to convince even their own supporters. With the fourth anniversary of start of his papacy taking place on March 13th, Leaders League profiles a communications genius. While the majority of politicians struggle to unite their base, Pope Francis has seen his audience grow well beyond a pope’s traditional public. While their message at best goes unheard and at worst lacks credibility, his convinces the majority of people. 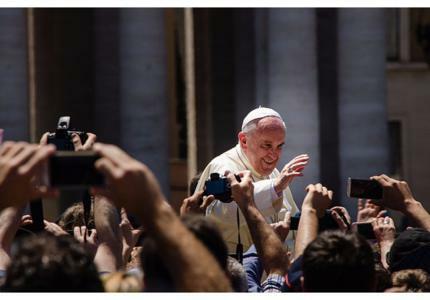 Could it be that Pope Francis is a better communicator than our professional public figures? Judging by his popularity level, the answer is undoubtedly yes. And four years on from his election it’s difficult to explain away the phenomenon as simply the result of a contrasting approach to that of his predecessor, Benedict XVI, whose style was as aloof and austere as his successor’s is charismatic and sympathetic. For many, the reasons for the popularity of the Holy Father lie elsewhere. They are to be found first in the strength of a personality that goes against the grain of media outcry and political posturing; and second in the weaknesses of an era where such qualities as his are rare. Ours is an era more receptive than ever to a discourse founded on values since these very values have virtually disappeared from the public sphere, where politicians supposedly embodying such values merely trumpet them on the campaign trail. What has permitted the rise of a deficient society and paved the way for someone such as Pope Francis who “speaks not only of values, but of universal values,” as Vincent Leclabart, founder of advertising agency Australie stresses. According to Mr. Leclabart this quality is an essential asset that makes his message “accessible to all.” And how much easier it is to get through to people when your message is open and direct – so different from the delivery we are used to hearing. Able to appeal to listeners who are sick of the same old sound-bites and the posturing common in communication, Pope Francis has also managed to shake up the internal workings of the church. “The Pope is a frank speaker and he uses this trait to change the dusty conventions of his institution while at the same time respecting the fundamental tenets of the Catholic Church and its position on issues such as assisted reproduction and gay marriage etc,” explains Mr. Leclabart. The result: he offers a consistency of message and an openness of approach, and this is the winning formula for reaching out to a new audience without alienating his core following. Summary Dentons Aspires to Be Not Only a Law Firm, but a Business Solutions Firm Mercedes Erra: “A leader will sometimes doubt, but always keeps the faith” Najat Vallaud-Belkacem: "A leader needs to forge an intimate conviction that leaves very little room for doubt" Jacques-Antoine Granjon: “A leader must surround himself with more qualified talents than himself” Claude Onesta: “My role is to create the conditions that allow the players perform to their best” Clara Gaymard: “A liberated company puts people at the heart of its ambitions” Guy Forget: "A leader must understand what makes his people tick” Anne-Sophie Pic (three Michelin stars chef): “In the kitchen everyone has their part to play” Bill George: "Just as a calm sea doesn’t make a great sailor, a period of economic stability doesn’t make great leaders"